Corian® is a wonderful choice for countertops as it is a unique material with a beautiful finish. Yet even though millions of people have discovered how fantastic Corian® is, there are many others who don’t know a lot about Corian® or who haven’t even heard of it. We’ve put together a list of the top Corian® questions to help you learn more about this great countertop choice, including everything from installation to Scottsdale Corian® countertop repair and Corian® countertop refinishing in Scottsdale. Corian® is a brand of solid-surface countertop produced by DuPont. “Solid surface” refers to the fact that Corian® is made of the same material all the way through the thickness of the countertop. If you were to cut the counter in half, you would see the same material, texture and color all the way through the thickness. Because of its unique construction, Corian® can be cut into any shape and can be drilled, routed, sculpted and even bent. You can work with it the same way you would a fine wood, allowing you many more design options. Corian® comes in more than 100 colors, giving you many more options for your design, as well. How is Corian® Different from Other Materials? Corian® also has many more design options thanks to the ability to work the material in multiple ways and thanks to the wide variety of colors. You can cut Corian® as a single piece, including a backsplash or overhang. You can even combine Corian® with materials like wood, brass, glass, tile or granite to create unique and interesting combinations of colors and textures. Finally, Corian® has a non-porous surface, which means that it will not absorb liquids or bacteria the way other countertops can. You can easily clean the countertop, and you don’t have to worry about a lot of the common damage that countertops suffer. Corian® is easy to clean, and you don’t even have to seal it to keep it protected. Can I Place a Hot Pot Directly on Corian®? One weakness of Corian®, if it can really be considered as such, is that you cannot place a hot pot or other dish directly on the surface without worrying about damaging it. You can do this with some materials, such as some natural stones. However, since Corian® is a manufactured material, it is susceptible to being damaged if it is subject to temperatures higher than 212 degree Fahrenheit (100 degrees Celsius). It will be fine to place hot pots on the countertop in most cases, but unless you want to get out a thermometer and check the temperature to know for sure, it’s best to always use a pot holder or trivet for any hot pots you need to rest on the counter. Also be careful when using anything with an open flame or electric cooking appliances, like crock pots. If you do accidently put something hot on the counter and damage it, you can easily repair the countertop in most cases. You just need to contact a professional experience din Corian® countertop repair or Corian® countertop refinishing to evaluate the damage and let you know what’s possible to correct it. How to Clean Corian® Countertops? One of the biggest benefits of Corian® countertops is that they are very easy to clean and maintain. To clean your Corian® countertops, you need only use warm, soapy water and a soft cloth or sponge. You can also use a dedicated countertop cleaner or an ammonia-based household cleaner. You can also keep your Corian® countertops clean just by keeping them dry. If water and other liquids are allowed to rest on the surface, the countertop can appear dull over time. Make sure you clean up spills immediately and that you wipe the surface dry after cleaning (even when using household cleaners). Don’t use harsh chemicals on the surface, including paint removers or oven cleaners. If you are cleaning something with these chemicals, make sure to do the work somewhere else. Overspray and spills can damage your countertops easily. Of course, always ask the Corian® experts if you have any questions or concerns about caring for or repairing your Corian® countertops. 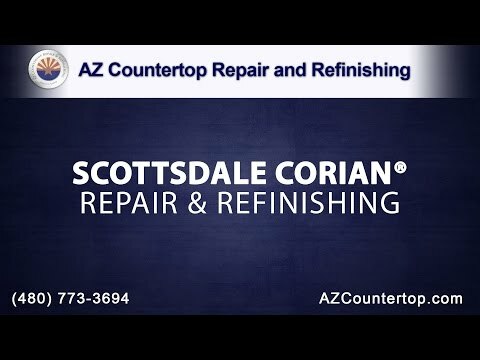 AZ Countertop Repair and Refinishing are the Corian® countertop experts in Arizona! Our professionals specialize in both Corian® countertop repair and Corian® countertop refinishing to ensure that your surfaces always look their best. We also perform Corian® sink replacement for your bathroom or kitchen. Call us today if you have damaged countertops or sinks that need to be repaired or replaced.